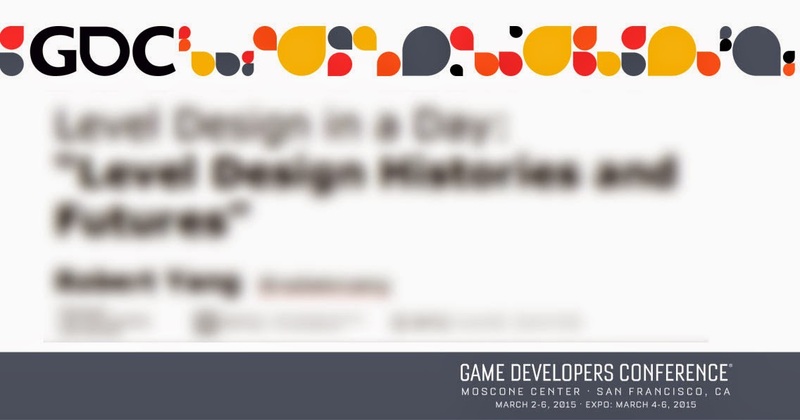 I'll be presenting a talk on "Level Design Histories and Futures" at the Level Design In A Day track at GDC 2015, alongside other stuff by Clint Hocking, Joel Burgess, Steve Gaynor, David Pittman, Forrest Dowling, Nels Anderson, Jake Rodkin, Kate Craig, Brendon Chung, and Liz England. It's a huge honor to be associated with these people. My talk is about level editor histories, the level designer as an industry role, level design as modernist formalism, and what a postmodern sustainable level design practice might look like. I'm kind of serving as the theory-heavy talk this year, right at the end of Tuesday at 5 PM, so I'm going to try to synthesize a lot of the previous talks together and propose some frameworks to digest them... and um I hope I'll see some blog readers there / I hope you'll still be awake at that hour! If you can't make it to GDC, I'll try to put up the slides afterward, and I'm sure it'll be streamed or recorded or something.